I agree, it looks quite ugly and is really more like flash cards. I had the opportunity of swapping it against a tarot bag that was really huge fun to make - I don't know whether I'd have paid money. Especially since on one of the pictures, it seems that they put on the Hebrew letters wrongly. Ignorance of Hebrew when using Hebrew is one of my pet peeves. I don't know how it will look in reality but hm.... if it really looks like that, it's an embarrassment! At least I won't have any qualms writing on it and using it as flash cards. And the second, yes, it's on my wishlist too. It's odd for me seeing some of the GD Kabbalah stuff as it seems so weirdly incomplete. I am not sure that I would have any understanding of navigating it without the study of the Torah and Jewish background. It is only a piece of the total, not the totality itself- so I tend to actually not use the associations with other decks and base it primarily on numerology and base fundamentals of the majors. Definitely strange for me. But I vacillate between using cards in general and then later putting them on the shelf. I find it is a well made and simple tool for this purpose. You are not overwhelm by too much data and you can play memory game with it by picking a card and trying to reformulate the meaning wrote on the other side of the card. The cards are large so it's easy to read on them. There's a LWB in the box that explain why this deck and how you can use it. Well made tool in my opinion! I have worked a bit with the Kabbalistisches Tarot by now and I'm pleasantly surprised. No mixed up Hebrew letters, and the cards are nice to handle. I like the decans in the minors and the clarity and simplicity of the whole deck. It's a nice companion to the Thoth and especially the Hermetic (which I know much less than the Thoth). I will hopefully one day be able to invest in a better kabbalistic deck but for now, this one is good enough. I looked at the Kabbalitic Tarot one day, and it was kinda very expensive for what it is. It is just some simple diagrams of Tree of life to each card, which can be drawn by pen on paper. And also these information is in many text books, so why would I need the deck? But I thought maybe it would be good for flash cards for studies. So I got out one of my least favorite tarot deck - not used at all just sitting in the draw for years. It has large border white space, and is called "The Destiny Tarot ", and I was drawing each sephiroth, path of Tree of Life, the Hebrew letters, and astrological association to each Tarot card. It was tedious, slow and boring job, and still about 50% more to go. Anyhow, my favorite deck for studying Kabalah is Thoth deck and Tarot of Ceremonial Magick by LMD. I might try using the GD deck by Robert Wang soon. But the best study deck with the best book is the Tabula Mundi with Liber Mundi. It's wonderful - coherent, beautiful, based on solid studies and visually creative at the same time. The more I work with it, the more I respect the artist. They are the ones of beautiful decks indeed. Thanks for sharing. 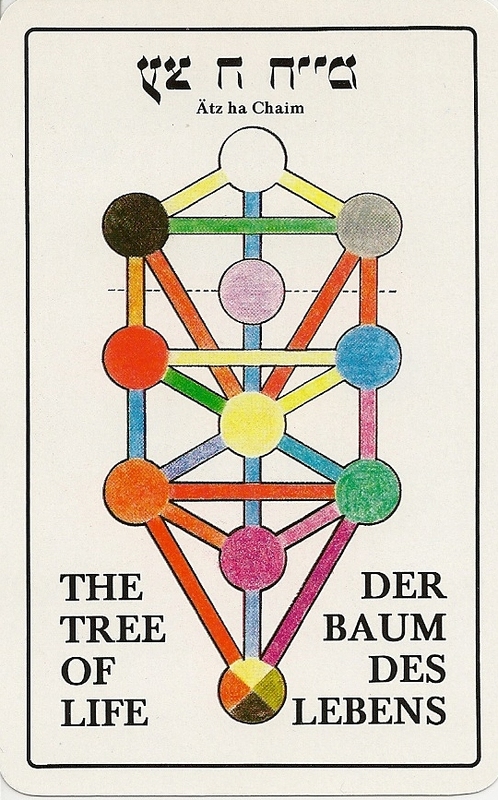 Damn, the Hermetic Kabbalah Tarot looks so nice. I need more money and more time. Does it come with a helpful LWB? There is much stuff going on in the seven which I do not understand. What is the 2.4, 2.5-thing? How about the dices at the bottom? And what about the Hebrew stuff? The LWB is beautiful and in colour, but doesn't go into much depth. It does show the details on each card - the numbers are lamen-based angel numbers (one of the additional cards and the LWB show the lamen. The Hebrew letters show the divine names - I didn't dive into that topic yet at all but I do notice that the divine names in Hebrew letters and the angel names in Latin letters suit. They start with the same syllable, and the angel get either the syllable -ya or -el, both of which are divine names. I think Robert Place explains somewhere that you can use three dice for tarot readings without dice - again, this is something I'll have to sit and work out one day. It's a very nice deck, and it has extra cards (like the Tabula Mundi). A very beautiful Tree of Life, a lamen card, and extra cards that allow you to stack the deck the way you want it: Adjustment/Justice and Strength/Lust, and the tzadi/he cards are double, too. So the deck works with either RWS or Thoth, which is great. On their website, the artists offer pdf files of the additional material, including a longer version of the LWB, where you can get the explanations for the card faces.